A new Police Inspector has started working in the Formartine area. Inspector Nick Thom, who has responsibility for Ellon, Oldmeldrum, Methlick and Turriff, has been a Police Officer for 27 years and started the position this month. He joined legacy Grampian Police in November 1990 and worked predominantly in the Tillydrone and Northfield areas. After four years in uniform, he joined the CID, working as a Detective within the Crime Squad. In 1997, he became the Torry Community Officer before returning to Aberdeen CID in 1999. In 2000, he joined the Drug Squad for three years, where he worked on a number of high profile cases. In 2003, he was promoted to uniform Sergeant in Huntly, covering a large rural area down to and including the Lecht. After another short spell in the CID in Inverurie, Nick was transferred to Professional Standards as the Force Vetting Officer. 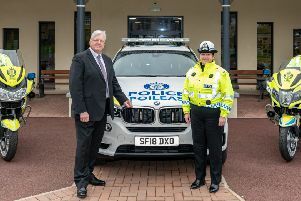 In 2007, he returned to uniform duties in Banff, before another spell as Detective Sergeant in the Proactive and CID in Peterhead and Fraserburgh. The following year, Nick was promoted to Detective Inspector within the Force Intelligence Section and was later temporarily promoted to DCI there. Between 2012 and 2013, Inspector Thom took on the role as Kittybrewster Community Policing Team Inspector and worked closely with Partners in the communities to resolve a number of local issues. For the last four years, Inspector Thom was the Intelligence Manager for North East Division, gathering, developing, analysing and disseminating intelligence around Serious and Organised Crime and criminals living and committing crime in local communities. During this time, PI Thom led a number of high profile investigations, supporting operational colleagues and ultimately continuing to ensure that NE Division remains an extremely safe place to live. This role also provided PI Thom with an overview of some of the local issues which affect the Formartine area, and this has been particularly helpful during his transition back to front-line policing. PI Thom said: “I’m very proud of my new position as Formartine Community Policing Team Inspector and I look forward to getting out into the community with my team, to provide an excellent policing service. “Almost half of my career has been within specialist roles within the CID and I hope to bring some of the experience gleaned in other areas of policing, into the Formartine area to reduce crime and positively impact on local issues. “The Formartine area is a safe place to live and I am committed to working with the local communities to target the minority who choose to break the law. “I particularly want to tackle violence, drugs and acquisitive crimes, concentrating on those who commit these crimes and ensure they are dealt with robustly. “I will also seek to address anti-social behaviour issues and will be working closely with communities and the local Roads Policing team to promote road safety. “I want to send out a clear message to offenders that behaviour that impacts negatively on our communities will not be tolerated. “I will be continuing to work closely with our partners as well as the community to build on the already strong relations that are in place, and appeal to anyone with information regarding individuals in our communities who are committing such crimes to share that information with us so that we can take action against them.